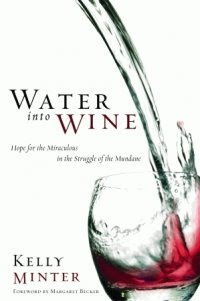 I recently read a great book written several years ago by Kelly Minter. If you are looking for a beautiful, easy to read, reminder of what Christ does in our lives, I recommend this to you. One picture I have loved thinking about since is the fact that those servants poured water into a jar and went to serve it. How simple. How trusting. That water became wine on the way. I love how that is a beautiful picture of how we must trust and endeavor with Christ. He did not turn the water to wine and then pour it into the serving jars. It happened as the servants were obedient to a very simple call. Pour the water into the jar. Because of that simple obedience, many people took and drank the wine of Christ. "...even on my best days, I can't make wine." "Simply doing all the "right" things, in and of themselves, only leaves me with colored water. It looks authentic from the outside, but when others get close enough to imbibe, they discover that it is tasteless--because my good works and my attempts at righteousness are not of miracle caliber. I need God to transform my jealous heart." "This transformation of my heart is not about me trying harder to rid myself of jealousy, but about allowing God to do a deeper work in my heart so the root of jealousy can be pulled out. This can never be accomplished through the strength of my life; it can only be accomplished through the weakness of my death." "We have too often reduced the glory of the gospel to bumper stickers, condemning slogans on t-shirts, and awkward quotes on church billboards. We have unthoughtfully pushed verses or tracts on those who needed our time, love, and attention more than a quick overview of our beliefs. And we have demanded that people clean up their lives before we introduce them to the boundless love of Jesus." Wow, Steph. I am blown away by this post. I need to read this book. My heart NEEDS to be changed. Thank you for your heart. It's beautiful! You are always so sweet to me. I really enjoyed this book. love you. LOVED this...I need to read this book...I have loved Kelly Minter's study.